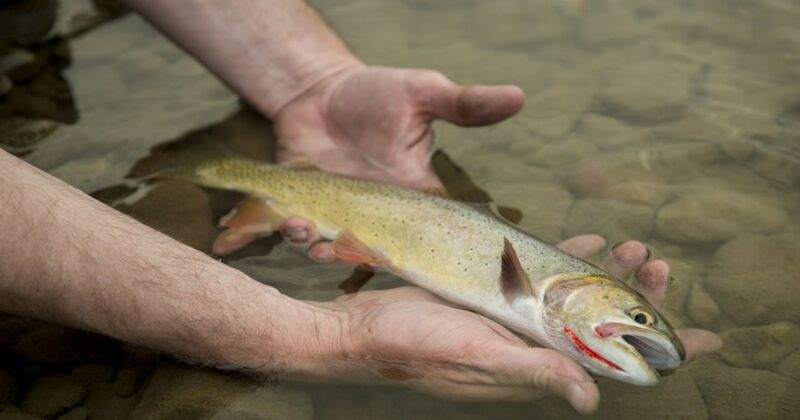 WASHINGTON, D.C.: In North America (including Northern Michigan) there is an already embattled native trout population that continues to face serious threats, according to a comprehensive new report released by Trout Unlimited. “The State of the Trout” details the status of 28 separate species and subspecies of trout and char native to the United States. Of those detailed populations, three are already extinct, and more than half of the remaining trout and char populations occupy less than 25 percent of their native waters. While the state of trout in America is tenuous, there are success stories that prove trout recovery is possible – the report lays out a roadmap for that recovery. Trout Unlimited’s staff of scientists spent more than a year preparing the detailed report with input from TU’s field staff and independent, federal and state fisheries experts. The full report is available in digital form at tu.org. Non-native species and climate change head a long list of challenges facing trout, which also are under pressure from increased demand on the nation’s water resources, loss and degradation of habitat, and different types of energy development. In the Great Lakes region, native brook trout have been impacted by dams and roads that have fractured habitat, by historical logging practices, and by high soil erosion from agricultural practices. Brook trout are found in only half of their historical habitat, and that habitat faces potential degradation due to a warming climate. Coaster brook trout, which move among the Great Lakes and tributary streams, exist in only 13 percent of historical watersheds due in part to overharvest, stream barriers and competition from non-native salmon and steelhead. Populations of slow-growing lake trout have, over the past century, been ravaged by a combination of commercial fishing, pollution and nutrient enrichment, and the introduction of non-native species, including the sea lamprey. While bringing attention to challenges facing trout, the report highlights many success stories. For example, the report notes how Trout Unlimited, state agencies, the Natural Resources Conservation Service and dozens of other partners have joined forces to restore more than 75 miles of trout habitat in the Driftless Area of Wisconsin, Minnesota, Iowa and Illinois. Prior to the work, sampling counts found 200 to 300 trout per mile of stream. Post-restoration, trout numbers often top 2,000 fish per mile. In the end, it’s all about hope. Trout Unlimited is the nation’s oldest and largest coldwater fisheries conservation organization dedicated to conserving, protecting and restoring North America’s trout and salmon and their watersheds. Follow TU on Facebook and Twitter, and follow our blog for all the latest information on trout and salmon conservation.